The legendary Matarese family continues its winning ways as their M&M Hunting & Sporting Clays – home of champion Anthony Matarese, Jr. and venue for top clays competitions – exerts their presence of three generations in the industry with an expansion of “fair chase” hunting complemented by old-world luxe lodging within earshot of the Mid-Atlantic’s largest cities. 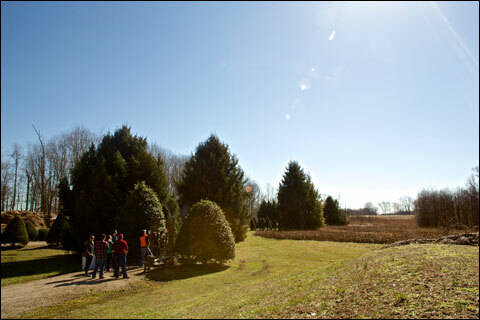 M&M Hunting Reserve & Sporting Clays in Pennsville, New Jersey now becomes the Mid-Atlantic’s principal destination for any enthusiasts wanting world-class sporting clays and instructions, as well as duck and upland hunts, plus upscale accommodations in a single setting. 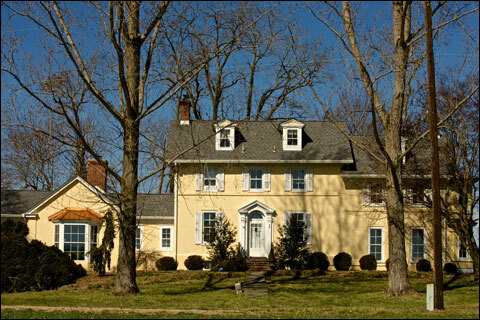 The collection of clays and hunting packages is likely more activity than anyone can accomplish in a single day, but with the recent acquisition of a farm adjacent to the original property the Matareses gained an historic house circa 1680 now under conversion to guest accommodations. When complete, the lodge will have 14 beds that can sleep up to 17 guests. There’s also an entertainment room with bar, card table and other distractions. Official opening day is slated for Fall 2016. The new historic lodge at M&M Hunting Reserve & Sporting Clays will officially open in Fall 2016. 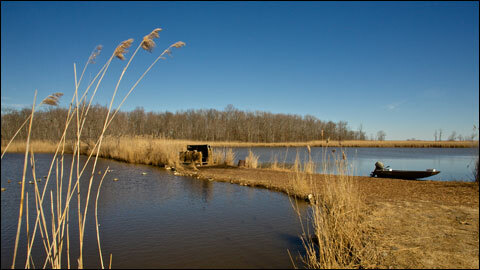 Wing and clays shooters living between Philadelphia and New York City can now drive one to two hours for access to one of the most complete public facilities on the east coast. It’s a full-service clay shooting and hunting operation offering numerous wingshooting packages, two sporting clays courses, a world-renowned shooting school and lodging. The expansion started during the summer of 2016, when the Matarese family restructured their hunting program to provide a more traditional “fair-chase” experience that truly sets M&M Hunting Reserve & Sporting Clays apart on their prime 1,400 acres. It’s the behind-the-scenes operations that serve as a foundation for the huge expansion of the hunting programs come Fall 2016. “My father started M&M in 1979 when he was 18 years old. Thirty years ago hunting made up 85 percent of our revenue; now we make about 15 percent of our revenue from hunting. If you look at the next 30 years and how the environment will change for sporting clays and raising game birds, so we have to keep changing to maintain our growth and high customer satisfaction. And in 30 years our business model won’t be the same as today,” said Mr. Matarese. As a visitor to M&M Hunting & Sporting Clays you probably won’t realize that the Matarese family operates a game-duck business that grew from 2000 ducks per year in 1980 to 180,000 as of 2015. 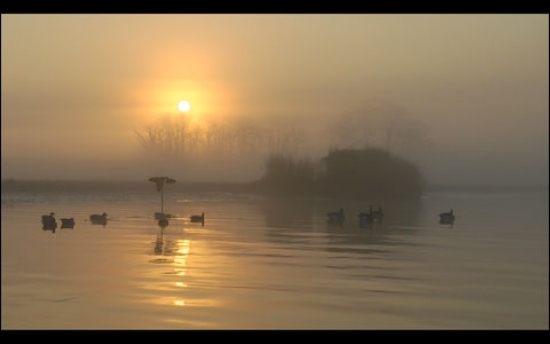 “We’re really the only place in the U.S. that raises game ducks on such a large scale,” he said. The growth stems from the Matarese’s indigenous breeding environment. 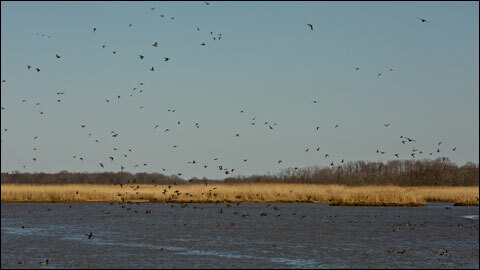 Mallards in flight over the waterways of M&M Hunting & Sporting Clays. By leveraging its geographical advantage, M&M Hunting & Sporting Clays can seize on economic trends that otherwise encumber surrounding competitors. Notably, preserves are fighting each other on the price per bird instead of the hunting experience, according to Mr. Matarese. Case in point, the new decoying mallard hunting programs at M&M Hunting & Sporting Clays. Like wild ducks, there’s no guaranteed bag. Here, harvest rates depend on weather and flight patterns of M&M’s mallards. Still, to stack the odds in your favor there’s a professional guide with a dog. Mallard decoys at M&M Hunting & Sporting Clays. The decoying mallard hunt is generally offered from October 15 through January 15, although the season may be extended based on weather conditions and trading patterns. A four-mallard limit per hunter is strictly enforced. Hunts will last 2½ hours, unless you reach your limit sooner. The cost is $275 per person with a minimum of two hunters and maximum of four per blind. Released mallard shoots are held over two large impoundments on the edge of a natural marsh. Expect hundreds of ducks, offering pass shooting, decoying shots and a guaranteed bag limit. The released mallard shoots start at 9 a.m. or 1 p.m. and are priced at $255 per person, including a guaranteed bag of 10 ducks or $525 per blind for up to three hunters, including a guaranteed bag of 20 ducks. Extra mallards are available for $24 each. Given the local history of the Matarese family, their mallard hunting is intended to evoke a golden age as recounted by men on the front porch, around the table or in the blind – an outdoor reminiscence when wild game was abundant and hunting know-how traveled by word of mouth instead of the Internet – when legends of the hunt were born around the fire instead of through selfies. A duck blind at M&M Hunting & Sporting Clays. That sentiment also applies to the M&M Hunting & Sporting Clays upland experiences. The Matareses don’t release their game birds the morning of the hunt, as we’ve come to expect at many preserves. By contrast, thousands of young pheasants and partridge are released early in the season, allowing them to adapt to the rural habitat. This practice helps the birds behave like those in the wild. Supplemental birds are released throughout the season to sustain challenging hunts. For a flat rate, wingshooters get bag limits. While there’s no guarantee of limiting out, Mr. Matarese expects an abundance of flushes and reasonable shots. In the interest of safety, M&M Hunting & Sporting Clays caps hunting parties to four plus the guide. Upland hunting at M&M Hunting & Sporting Clays. Beyond hunting over dogs, M&M Hunting & Sporting Clays has a European Style Driven Bird Shoot that simulates high driven shooting of pheasants and partridge. These shoots can be scheduled with a combination of partridge, pheasants and even ducks upon request. All European style bird shoots include lunch for all hunters. 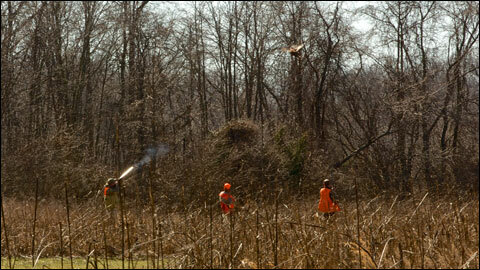 Mr. Matarese said that their goal was to make upland hunts as accessible as possible. That’s why a variety of half-day, full-day, private and seasonal hunting membership packages are offered. For example, half-day upland excursions start at 8:30 a.m. or 1 p.m. for $195 per person with a minimum of two paying hunters. The upland hunts can be bundled with duck hunts and lodging as well. 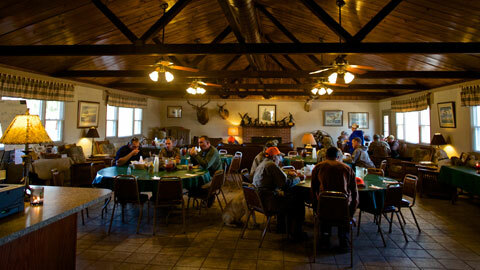 The dining room and lounging area at M&M Hunting & Sporting Clays for breakfast and lunch. While the hunting and sporting clays at M&M Hunting & Sporting Clays are seasonal, the shooting school operates year-round on the sporting clays courses, which actually close from mid-June through mid-September. One of the stands on the beautiful sporting clays courses at M&M Hunting & Sporting Clays. Under the banner of Mr. Matarese’s A.I.M. Shooting School, he serves as Chief Instructor, accompanied by Associates Diane Sorantino and Dan Krumm. Mr. Matarese, though, is the main draw with his impressive track record. He started shooting competitive sporting clays at age 10 under the guidance of Olympic Medalist Dan Carlisle. 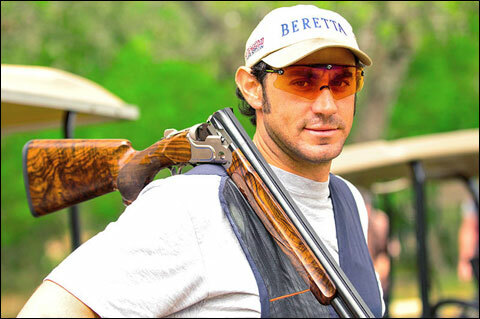 Over the years he racked up eight Junior titles, medaled every year from 2007 through 2015, made All-American Team Member 18 times, 14 Time Member of Team USA Sporting Clays, 11 Time Member of Team USA FITASC and in 2014 became inducted into the National Sporting Clays Hall of Fame. Diane Sorantino is probably the most accomplished woman sporting clays competitor of all-time. With more than 40 years as a competitive shooter and also a student of Mr. Carlisle, she’s a 5 Time US Open Ladies Champion, 3 Time Ladies National Sporting Clays Champion, 5 Time National FITASC Ladies Champion, 14 Time Member of United States Shooting Team, won 27 international medals both individually and on a team in addition to other award-winning competitive achievements. As a result, the instructional foundation they share allows them to work together cohesively to provide a consistent shooting method as advocated by the A.I.M. Shooting School. Mr. Krumm, meanwhile, is a veteran recreational sporting clays shooter and an avid waterfowl hunter. He’s been mentored in the A.I.M. Shooting School method by Mr. Matarese. He specializes in instructions for beginners and recreational shooters. Prices for the shooting school vary by instructor and day of the week. The Matarese family, having looked back over the incredible history of M&M Hunting & Sporting Clays, is forging a new legacy that will propel them decades into the future. For the rest of us, we just can’t wait until Fall to explore the new hunting and lodging that awaits us. The M&M legends live on.